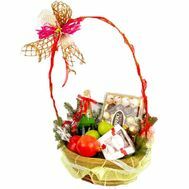 Gift baskets are a unique gift that can not leave anyone indifferent. They look extremely chic, in support of this - a lot of the recipient's pleasant emotions. 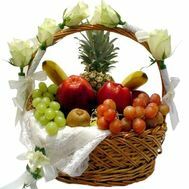 Depending on the customer's preferences, the basket can be filled with flowers, toys, fruits. 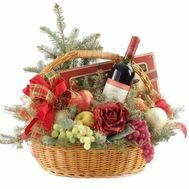 Floristic salons offer a huge range of festive baskets: from traditional corporate to romantic and cute children. 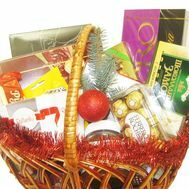 Now especially popular are gift baskets for the New Year. The classic options include the basket "A gift for the Christmas tree" (exquisite red and white carnations, sparkling wine, chocolates and New Year's decor), "Bengal lights" (a bright composition consisting of assorted chocolates, bottles of red sparkling wine, spruce sprigs, green monsters, decorative elements). Such an original gift will certainly be remembered for a long time! Gift baskets you can buy without leaving your own home. Regardless of the occasion - Birthday, Jubilee, Easter, wedding day, birth of a baby, New Year, this present will bring a lot of impressions. Pleasing your loved ones with attention is possible without any reason. The option you choose will be promptly delivered to your home and office. 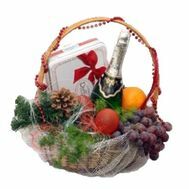 Recently, so-called "grocery" gift baskets have become very popular. 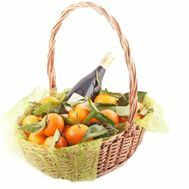 As an option, you can consider a basket consisting of selected goods from the sunniest Italy. This, for example, Parmesan, tender prosciutto, dry Martini, salami, dried tomatoes, several varieties of coffee and a host of other goods are conveniently placed in a beautiful wicker basket. And all this is quite inexpensive. For a couple in love it's better than this gift set you can not imagine. 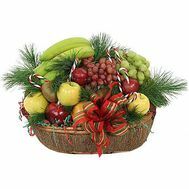 You can use such a basket and as a New Year's presentation to the boss, employees, parents or friends. 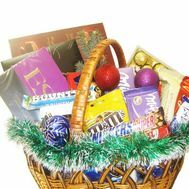 Try to make every effort to ensure that the basket contains only those products that your loved one will surely like. A wonderful 24-hour service will help you to realize even the most courageous idea. A gift consisting of various delicacies will certainly be appreciated by the recipient. 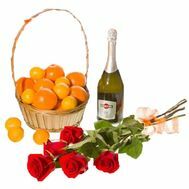 Not less popular and gift compositions and baskets of fruit. 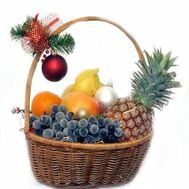 The basket "New Year's" looks interesting (and not less appetizing!) 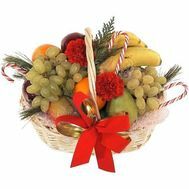 (Delicious fruits - pineapples, grapes, oranges, bananas, apples, pears decorated with fresh flowers and sprigs of spruce). 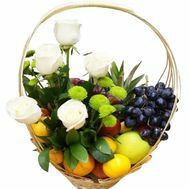 Fruit set can be changed at one's own discretion (for example, choosing more exotic fruits - longan, durian, mangosteen, jackfruit). Believe me, from such a delicious presentation it will be hard to come off!